Nintendo releases the official launch trailer for their brand new DS release. 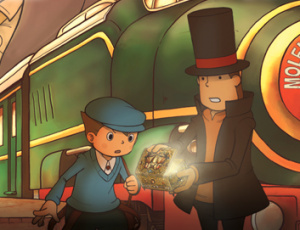 Well Professor Layton and the Diabolical Box has just recently hit store shelves in North America and to celebrate Nintendo has released a brand new Launch Trailer for you to check out. We're working on the review for the game as we speak, but to tide you over until we get it live, you can check out this brand new video. And European gamers don't have too much longer to wait in order to enjoy the game with its September 25th release date rapidly approaching. I could have sworn I saw this in Toys R Us the other day...how odd. I am loving this game so far! I haven't beat it yet but I'm already wondering how long it will be until the third game is released. I can never get enough Layton! Why do I have to make tea? Why am I exercising a fat hamster and how the heck do I put the camera together properly?!! So many questions about this game. Oh well, it was still loads of fun! One of the best DS games of 2009! And a very gentlemanly trailer as well. @zranoll Because it makes the mcguffin seem so much more Diabolical! Wow, looks very nice in action. Did they change the voice of Luke? Or did he hit puberty? This game seems pretty interesting, but I don't have a DSi. Luke still sounds humorously annoying.